Fresh fruit baskets are the perfect healthy gift. We offer a variety of fresh fruit baskets to choose from. Select the style that best suits the person you would like to impress. Our gourmet fruit baskets are made with only the freshest hand-picked fruit. For fresh fruit baskets we are only able to offer shipping to Toronto, Mississauga, and surrounding areas. For delivery across Canada and the United States we would send it to a gift basket company in the recipients local area. This fruit baskets is filled with an assortment of fresh fruit elegantly arranged in a sturdy round wicker tray. Included with the fresh fruit are 2 bottles of sparkling water and a box of crackers. This gourmet gift basket is loaded with an assortment of fresh fruit and gourmet products. 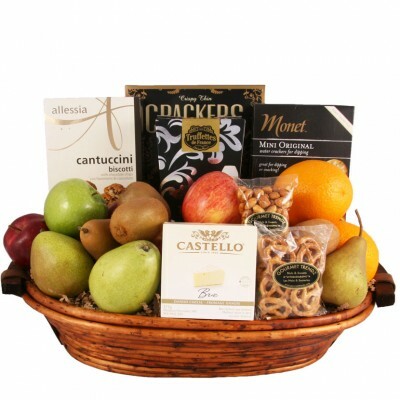 A honey brown wooden basket is filled with fresh fruit and gourmet items including cocoa truffles, crackers, Brie cheese, nuts, pretzels and biscotti. 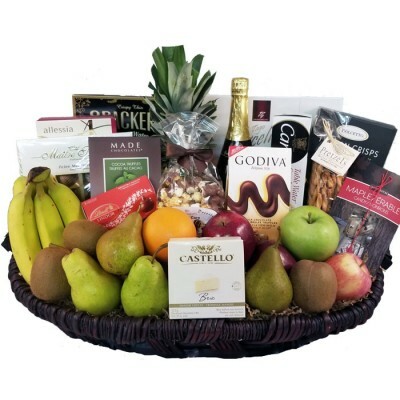 A stylish woven basket is filled with an assortment of fresh fruit. 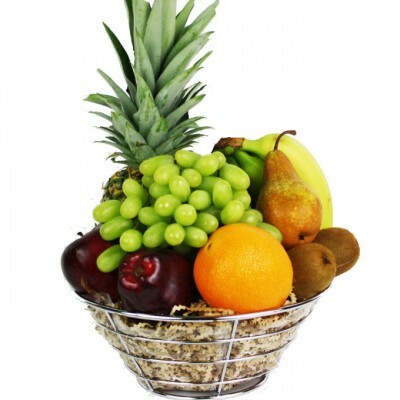 This fresh fruit basket is great as a gift when you are looking for a healthy option. Fresh fruit and gourmet products fill this large seagrass basket. Along with a great assortment of fresh fruit is a bottle of sparkling apple cider, fruit smoothie mix, gourmet crackers, cheese, chocolates, chocolate covered strawberries, cookies and other tasty treats. What Should Get Well Gift Baskets Include?